← Garden Junk Yard Sale was a huge success! If someone were to ask me about my decorating style, where others might say theirs was Traditional, or Boho, or even Eclectic, I would say mine is cottage style. 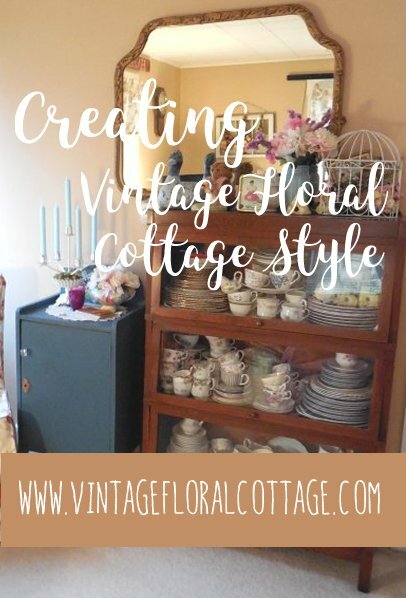 Or, more specifically, I would define mine as “vintage floral cottage.” That’s because those three little words seem to apply to nearly every decorative or even functional object that I bring into my home. And of course, that’s completely on purpose! 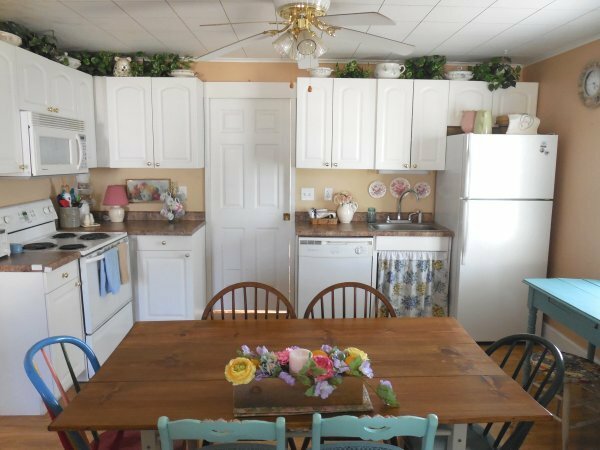 Whether it is a mixing bowl, or a new-to-me piece of furniture, it is going to evoke the comfortable, time-worn characteristics I have come to love and seek for my cottage style surroundings. Vintage – means used, from a time gone by, perfectly imperfect, showing its age and signs of previous use. Objects that are timeworn are right at home in cottage style rooms. Being able to appreciate a vintage item’s imperfections, and the history that it has, is very meaningful to me. I think this comes from having been given some beautiful hand-me-down pieces for my home, as well as being a long-time genealogist. I seem to seek that connection to the past. When I look around my home, I don’t see many things – furniture or accessories – that were purchased brand new. I simply don’t buy things that have a contemporary look… I go for chunky-legged tables, over-stuffed comfy pieces in floral fabrics, rose-covered china with pretty gold rims, and rustic, re-purposed items such as sawhorses and barn doors. Floral – I think that flowers and floral motifs are one of the cornerstones of cottage style, which is a direct extension of the fact that real cottages were and are often surrounded by abundant gardens. While I don’t have an extensive garden (I do have a sweet little flower bed! ), I do bring flowers indoors prolifically! I use silk and real flowers, old-fashioned floral patterns, and floral motifs on objects ranging from dinnerware to bedding. Of course, roses are a sentimental favorite flower, but so are peonies, lilacs, hydrangeas, chrysanthemums, and even just pretty leaves. Cottage – True cottages to me have a lot of architectural character: stone walls, fireplaces, porches, exposed beams and the like. They are simple, hard-working structures that squeeze a full and happy life into very small spaces, using handed-down furnishings and a minimum of fuss. I believe that any smaller home – even if lacking specific architectural elements – can be made to feel like a cottage with small cozy spaces, furniture that gets painted or re-upholstered instead of replaced, over-stuffed chairs, and the like. I don’t feel the need for a large home. I like feeling cozy, comfortable, and contained in my 650 square feet. Rachel Ashwell has dubbed her style “Shabby Chic,” and of course Joanna Gaines is the queen of “modern farmhouse.” I don’t have the books, products, and empires that these wonderful, inspirational women have (and have earned! 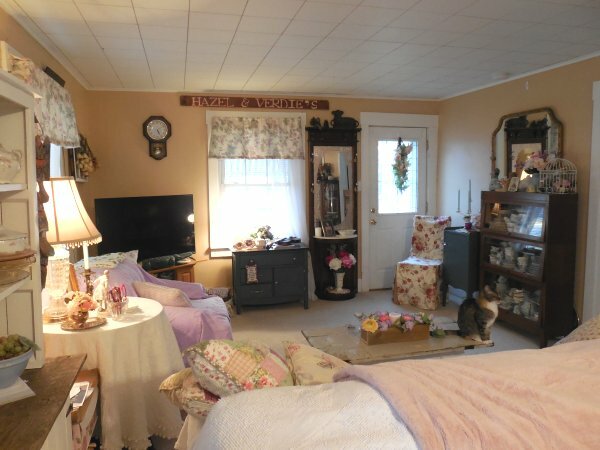 ), but I do – at last – have my Vintage Floral Cottage! Beautifully described! You are spot-on with your style! Haha and just when I think I’ve got it nailed down, I’m thinking about a new twist for the bedroom! 🙂 Thanks so much for visiting! I love your style. Thank you for your post it has helped me make sense out of my finds. Aww thank you Maria! So glad you found it helpful! 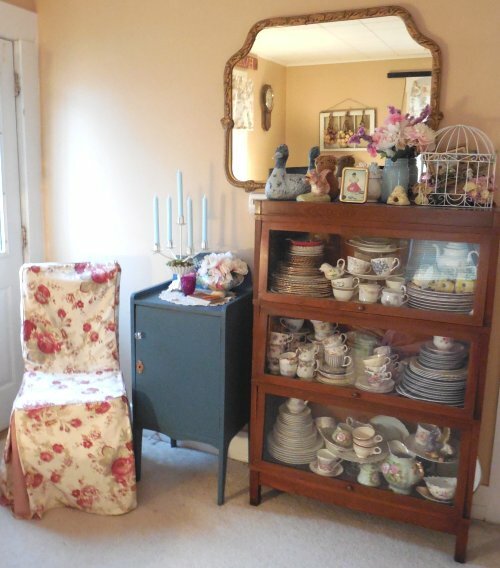 Love the term vintage floral cottage! While I wouldn’t consider it my style I definitely incorporate elements of it! Samantha, thank you for reading and commenting! I definitely have elements of other styles in my home as well! My tiny bathroom is more of a color scheme than a decor style. I love it! I love that you found your style and captured it. That lawyer bookcase is beautiful too. Those wood tones! Thank you, Tasha! The barrister bookcase belonged to my grandfather – he restored it and another one several decades ago. My brother has the other one – they are treasured family pieces for sure!